Through the use of building science and adopting best in class building practices as it relates to energy efficiency, our homes use dramatically less energy than a code-built home. What this means for you is your energy bills will be lower. But perhaps equally important is that the home will feel more comfortable as you move from room to room. Every home we build is inspected by a certified HERS rater. 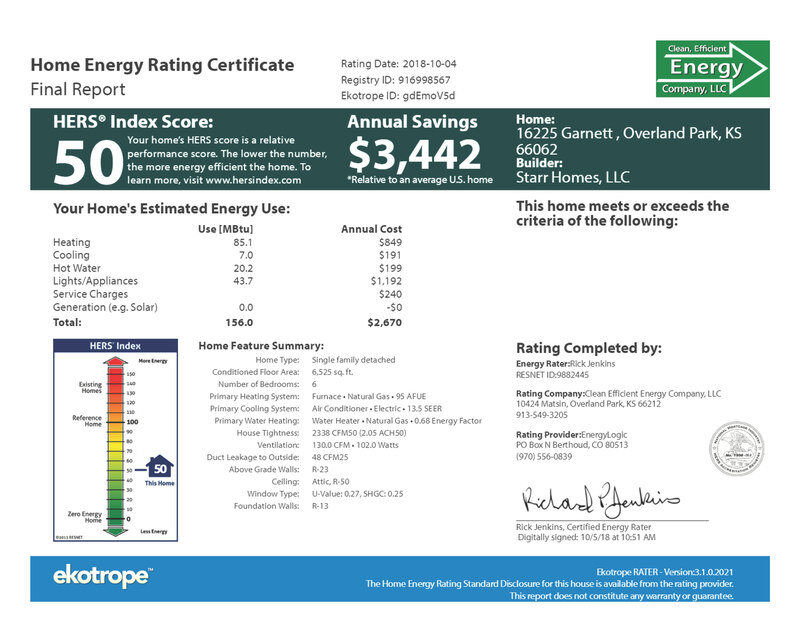 This independent series of inspections reveals the energy efficiency of the home. The ultimate HERS number reflects the percentage of energy consumption that the home uses. 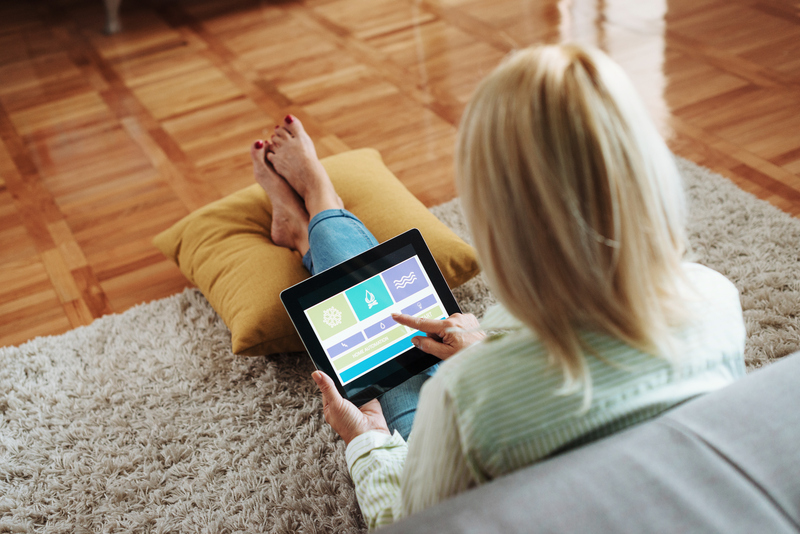 The lower the HERS number, the more energy efficient the home. A current code-built home has a HERS ratings in the 85 to 90 range. Our houses tend to have HERS ratings in the mid to low 50s, indicating they are nearly 35- 40% more energy efficient. Many existing homes in the Kansas City area will have HERS ratings in the 120 to 130 range. An example of one of our HERS ratings below indicates the home saves $3,442 annually in comparison to an average existing home. How does Starr Homes achieve this industry leading HERS rating? First and foremost is our attention to detail. Many builders could produce a similar spec and still not attain the same result. When it comes to energy efficiency, details matter. Our caulk and exterior sealant package is the best in the area. Starr Homes uses Typar house wrap, which provides the best moisture and air barrier characteristics. We use 2x6 exterior wall construction in our homes, which allows for 2 extra inches of insulation in the walls creating a perimeter insulation value of R-22. The attic receives R-50. We incorporate an energy heel on our roof trusses in all our homes. This increases the insulation around and over the perimeter walls significantly versus standard trusses or stick framing. The glass we use in our windows typically receives a triple low e-coating and is argon filled. The resulting energy efficiency of the glass provides windows with an industry leading insulated U value. U value windows increase comfort, decrease energy lost and maintain a higher humidity which is good for woodwork. We use an ERV (energy recovery ventilator) to bring in fresh air in a more energy efficient manner. The ERV provides filtered air from outside into your home. High efficiency direct vent water heater is standard. We use R-12.7 insulated double-sided steel garage doors. All range hoods vent to the outside to maintain a higher quality of air inside the home. A passive radon vent is connected to the interior drain tile. This helps reduce radon gas levels in home. It is typically upgraded with a fan to create a sub-slab depressurization system that actively dispels radon, water vapor and other sub slab gasses.